Special edition, 10.9 x 14 in. / 86 pgs / 34 bw. Published in an edition of 25 signed and numbered copies, Carrie Mae Weems' seminal 'page-by-page account of a woman’s life within the intimate setting of her kitchen' comes boxed with a silver gelatin print. 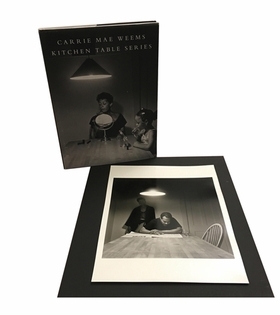 The 20 photographs and 14 text panels that make up Kitchen Table Series tell a story of one woman’s life as conducted in the intimate setting of her kitchen. The kitchen, one of the primary spaces of domesticity and the traditional domain of women, frames her story, revealing to us her relationships--with lovers, children, friends--and her own sense of self, in her varying projections of strength, vulnerability, aloofness, tenderness and solitude. Weems herself is the protagonist of the series, though the woman she depicts is an archetype. 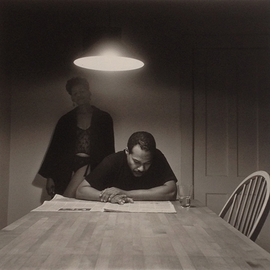 Published in an edition of 25 signed and numbered copies, this book includes a silver gelatin print of “Untitled (Man Reading Newspaper),” 1990/1999 (10.9 x 14 inches). FORMAT: Special edition, 10.9 x 14 in. / 86 pgs / 34 b&w.